Larry M. Goldstein is an independent U.S. patent lawyer and a leading expert in all aspects of patent quality. He is one of the top analysts in the world in the evaluation of high-tech patents. 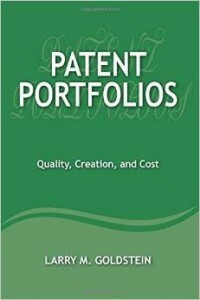 Patent Portfolios (2015) defines “excellent patent patent portfolio”, explains how to create one, and discusses the four methods companies use to budget for patent invesements. 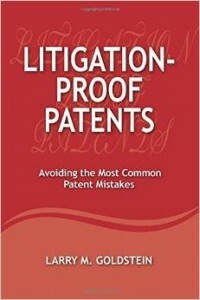 ·Ligitation-Proof Patents (2014) presents the 10 most common mistakes appearing in patents, explains how to avoid such mistakes, and discusses a clear method for writing the highest-quality patents. 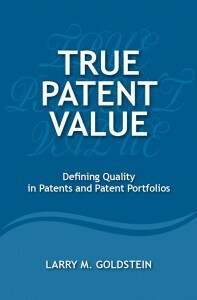 True Patent Value (2013) defines “patent quality” and explains how to evaluate the intrinsic worth of patents and patent portfolios.